Age and Scarpelli - who contributed to the success of LA GRANDE GUERRA (THE GREAT WAR) also as the authors of the dialogue, in which dialects of various regions were wittily interwoven - wrote the story (and the script, along with Marcello Fondato and the director) of another splendid film in which comedy was blended with the deep-felt representation of a war: TUTTI A CASA (EVERYBODY HOME: 1960) by Luigi Comencini. This time it is World War II and the crucial period following the armistace of September 8, 1943. As a result of the flight of the king and the prime minister to Bari and the exaggerated secrecy of the armistace negotiations underway, officers and soldiers suddenly found themselves without orders, with the Germans turning from allies to enemies and starting to fire on Italian troops. Comencini recounts the pangs of conscience of Second Lieutenant Innocenzi (Sordi) who, like many others, had never had the possibility of acquiring a political culture, had been a Fascist because that was all you could be and suddenly finds himself confronted by a series of events that what he learned at school, his tradiational values, leave him completely unprepared for. On the one hand, there is the King of Italy who has gone nobody knows exactly where, but to whom the officer has taken an oath of allegiance. On the other, there is Mussolini, up to recently the King's prime minister, who has set himself up as the head of a republic controlled by the Nazis. Innocenzi is persuaded by his father to contact the new Fascists, but they are people he instinctively dislikes. Devoid of orders, he decides to go North (he's in Campania) and on the way realizes that in order to avoid the Germans he has to throw away his uniform and put on civilian clothes. Disbanded, undecided, he proceeds aimlessly along roads full of refugees, on trains pursued by the machine-gun fire of passing planes, in the midst of ruins. He reaches Naples as the city, at the end of September, 1943, is rising up against Fascists and Germans, and the common people willingly risk their lives in the fight for freedom. Without thinking twice, Innocenzi realizes what his choice will be: he seizes the sub-machine gun dropped by a dead soldier and fires on the Nazis. The process of enlightenment is complete: fighting as a partisan, he redeems his honor as an officer, knows he is fighting for his country. Comencini deals with so complex a subject by means of a series of closely-connected episodes, set in various regions and environments and with a throng of also minor characters, but the main thread is never lost, and it's the thread of this confused Alberto Innocenzi in search of himself and of values that seemd destroyed, and of the crisis which seems to crush him and instead fortifies him and leads to self-commitment. 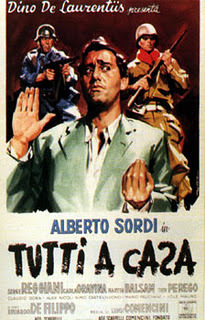 Along with Sordi are two foreign actors who give plausible portrayals of Italian characters: French actor Serge Reggiani as a Neopolitan soldier and American actor Martin Balsam as an Emilian peasant.